While students might be basking in a long summer break, that leisure time carries a heavy price tag: on average, students will return to school in the fall a month behind where they performed in the spring. And the learning loss is typically even greater for low-income students who were already behind their more affluent peers. 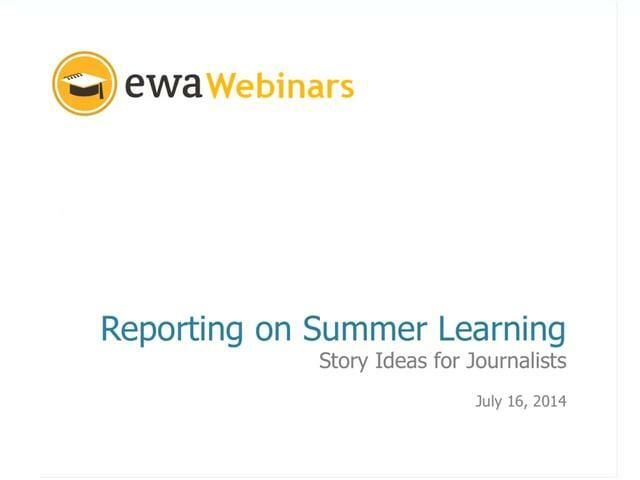 In this EWA Webinar, we provide background and the latest research on this important issue, offer tips and story ideas to enrich your own reporting, and look at how some districts are incorporating “student-centered learning” innovations into programs designed to mitigate summer learning loss. We also share details from the newest addition to the EWA Topics pages: Summer Learning. This webinar was made possible in part by a grant from The Wallace Foundation, whose Knowledge Center features resources on summer and expanded learning. What happens to student knowledge during the summer months?